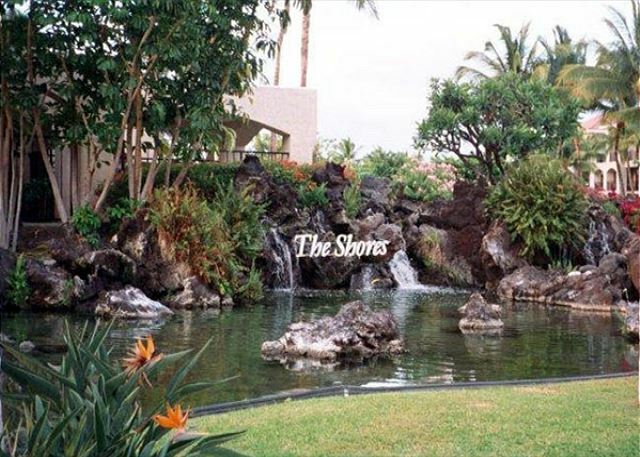 Shores 2 is a large ground floor villa situated along the 13th fairway of the Waikoloa Beach Golf Course. You will enjoy this quiet, serene spot with its excellent partial-ocean views and practical location near the beach, luaus, restaurants, shops, and cultural sites. Among the great amenities you will find here are high-end kitchen appliances, a barbeque grill, Jacuzzi bathtubs, a wonderful stereo system, CDs, and books, including numerous Hawaii guide books. There is a private carport located next to the entrance for your convenience. An ideal arrangement for two couples or a family, this unit offers two roomy suites placed on either side of the living area for enhanced privacy. Each contains a full bathroom with double sinks and separate bathtub and shower, and each has its own lanai access door. The master features a new luxurious king bed. Shores 2 has a private and relaxing lanai setting with glorious views of the golf fairways, framed by glittering ocean waves between the palms--an ideal spot to enjoy some outdoor dining or cocktails. 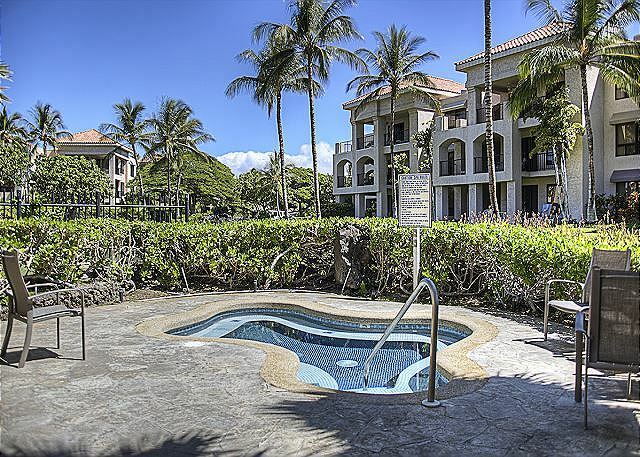 This condo is beautifully placed within a short walk to nearby excursions such as the Hilton Waikoloa Village and A-Bay beach. Plenty of beach supplies are on hand within the unit or available by request. Peggy is always a delight to work with for reserving a condo and is readily available should you require any assistance while on the property! Loved this condo...perfect location, well equipped with everything you could possibly need...will be back. Aloha spirit In Villa #2 ! We have been coming to the Shores of Waikoloa for many years, and have had excellent service from Waikoloa Realty, especially from Peggy and Tom! Unit #2 is a lovely location, very private, spacious and comfortable for two couples. We would be happy to return. Shores Villa - A Favorite Vacation "Home Base"
Everyone in our golf group was highly satisfied and comfortable in Shores 002. It was a wonderful "home base" for us as we played golf at various courses, then relaxed in the evenings is the spacious rooms. We made very good use of the well equipped kitchen. The Shores Villa is a favorite vacation spot and I will certainly be back again. Our golf group of 4 people were very pleased with Shores 002. In fact, we will be returning in a few months. This is a wonderful unit with a spacious kitchen, very comfortable beds and lots of space to relax. Thank you for your kind remarks. Your group is wonderful to work with and we look forward to your return visit. This condo is conveniently located in the Waikoloa resort area and is only a short walk to A-Bay Beach. We walked along the shoreline most days and saw many sea turtles at the Hilton. The lanai is very spacious and looks out on the golf course. The ocean can be seen in the distance and the sunsets through the palm trees were beautiful. We spent a lot of time out there and rarely saw anyone on the course. There is a nice Weber gas grill and the condo has every other convenience you would have at home. The unit was very clean, although we had a few ants in the kitchen near the sink. We were very careful with food and found a little spray to take care of them. Peggy was our contact and she did an excellent job providing all the details we needed. We separated all our recyclable, but had difficulty finding where to put them, so that was the only bit of confusion. The pool is small, but was very comfortable and only a few people used it. 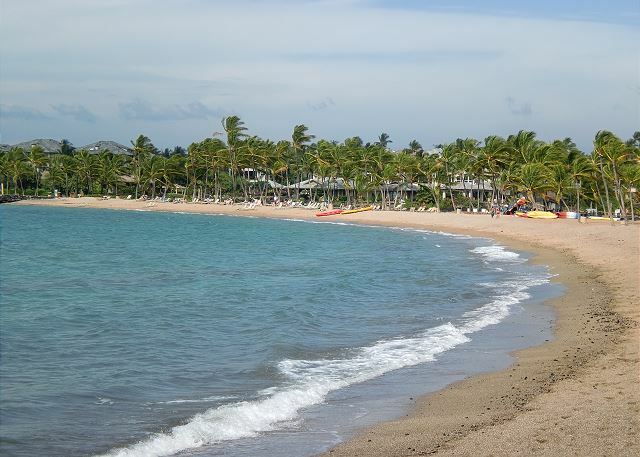 Mauna Kea & Hapuna beaches are a short drive and there are many other small beaches in the area. You just have to hunt them out! We were sad when our time was up and are already looking forward to coming back again. We would absolutely recommend this unit to anyone who likes to get away from the crowds, but still likes to be a short distance to many shops, restaurants, and other activities. Thank you so much for your comments. All units are equipped with instructions on where to place recyclables, but we will double check before each arrival to make sure that the sheet is with the guest keys and did not get misplaced. Nice that you were able to discover many of the beaches in the vicinity and enjoyed the shoreline walks. We look forward to having you back for a future visit. 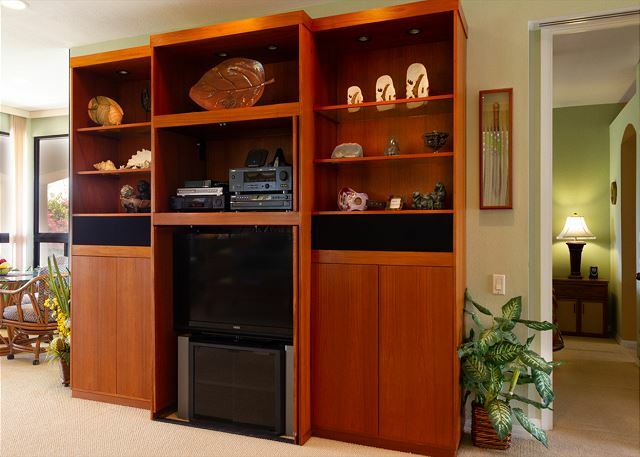 The unit was clean and functional (which is what I would expect from Waikoloa Realty units), the golf villa layout is very spacious, and we were very comfortable. I especially appreciated the firm mattresses and no back ache in the morning. Peggy from Waikoloa Realty was absolutely charming and responsive. The complex has an excellent fitness room, although the heart rate monitor is broken on the reclining bicycle. The pool is rather small, but good for kids. The grounds are pretty, but there are some bougainvilleas that look like they have also been around since the 1970s and need replacement. We found it a convenient location, and it is easy to walk down to the shopping centers or to the Hilton to visit the dolphins. Peggy with Waikola Real Estate was very quick to respond to any issues/questions that arose. The unit is dated, but spacious. The bed in master needs to be replaced as well as the carpeted areas. We will definitely book again! Second time staying in this unit. Love the 2 master suites and location on the unit. Only downside is the wifi router needs to be reset often but that wouldn't prevent me from staying there again. Always a pleasure to accommodate your family, and we appreciate your comments. The wireless router has been replaced. We really enjoyed our stay here. All the amenities we would ever need were in the villa. Kudos to the owners. Peggy was very helpful and great to deal with. There were a couple of maintenance items that we brought to her attention and she came over to talk with us and discuss a mutual time to have them addressed. The location and setting of the villa was perfect. We watched the sunsets from our comfortable patio. Very comfortable 2BDRM King/2 queens arrangement. Clean. Everything you would need (beach chairs, cooler, boogie boards, kitchen supplies, tools> Beautiful sunsets from the lanai. Pool area nice. 10 min drive to Hapuna Beach, the best on the island. Peggy, mgmt. agent was super to work with - helpful in finding the right place and very transparent and honest. The only improvement was that a lot of little maintenance items could be addressed by the owner spending a month in the unit. As always, enjoyed the stay and the rental completely. Everything was great and Peggy getting this all arranged was wonderful as usual. We had a great time in this unit and would definitely stay there again! 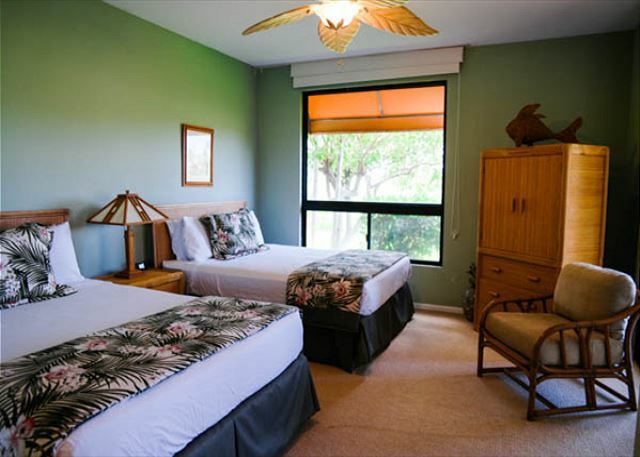 It was big and comfortable with a beautiful lanai and view of the sunsets and golf course. Close to the entrance of the complex and could walk to the pool.I also appreciated that there were supplies in the kitchen and for the beach and pool - even flashlights for the volcano. Which came in handy. Peggy from Waikoloa Reality was very awesome with every interaction and was so helpful in getting the unit that worked best for my family and made sure the price was right!